Summary (from the author's website): Nya is going to the pond to fetch water for her family--there and back, twice. She walks for eight hours a day. Salva is walking away from his ruined village to find safety--if there is any safety in his war-torn homeland. His journey across Africa to Ethiopia and then to Kenya and beyond will take many years. Two young people... two stories. 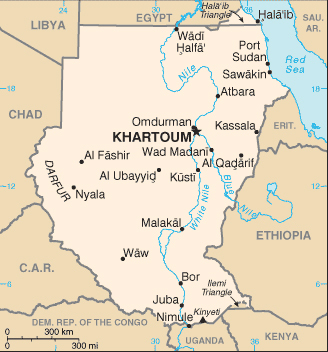 One country: Sudan. Review: I read this entire book while waiting for my daughter at her dance studio. I cried. In public. Okay, so it's not that unusual for me to cry while reading a book; it's always the happy parts that make me cry. This book is based on a true story, which makes it even better and more interesting. I have read a couple books about the lost boys of Sudan, but this book is really good. 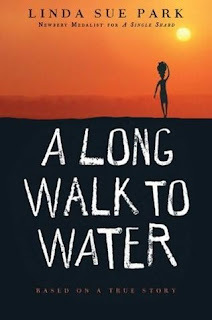 I liked that it was short, to the point, had a wonderful ending, yet still captured the trauma of Salva's experience of fleeing his family and his village, walking hundreds of miles to Ethiopia, and then spending six years in a refugee camp only to be returned to Sudan. 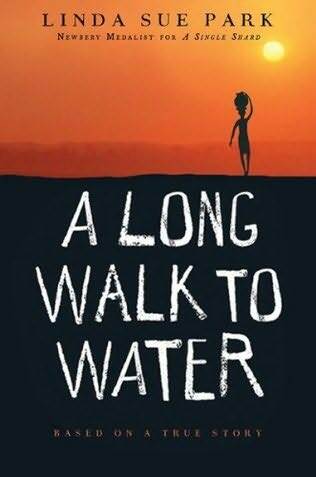 The other character, Nya, played only a small role in this book, but her story is one that is so touching and interesting: walking eight hours a day, every day, to get water for her family. She cannot go to school since she spends her time getting water. Salva and Nya's stories are told in alternating chapters. Nya's chapters are short (sometimes only a page or two) and in brown ink. Salva's chapters are longer and in black ink. And, of course, Nya and Salva are connected. They have to be or having them in the same book would be strange. 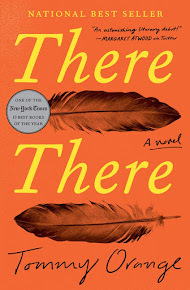 About three quarters into the book the reader figures out how their paths will cross, but it still made me so happy. I was amazed to discover that building a well in a village can have such a wide-ranging impact on the community. Not only do they get clean drinking water (obviously) and medical issues improve or disappear (again, obviously), but the villages can then build schools. And girls get to attend because they aren't spending their days walking for water! More than a geography connection, this book has a political connection. As I read this book Sudan has just had elections to decide if Southern Sudan will secede from the north and become its own country. Quite timely. I also liked that the books worked in the issue of clean drinking water and how vital and how simple it is to provide. 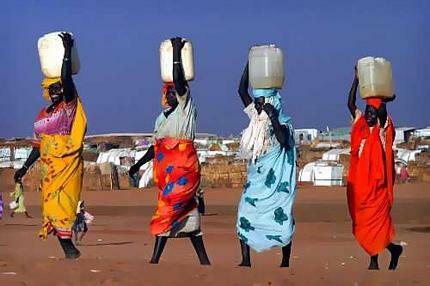 If you are interested, check out Salva's non-profit, Water for Sudan. It's amazing the difference a well can make for a village! Click to see my updated Google Map.